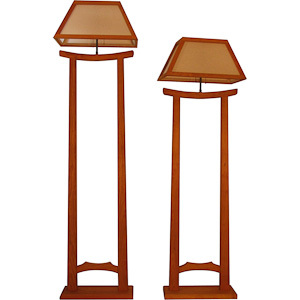 The Rockland Floor Lamp follows the design and style of the Rockland Series with a mix of Asian and Mission styles. This lamp has the characteristic arch at the top found on the Rockland Bed. The side supports are tapered and have Walnut inlays. The lamps have dual 3 way pull chain sockets and extra long cords. Each lamp comes with a matching shade made in the main wood type of the lamp and shoji rice paper. The rice paper is very sturdy with a PVC backing.